Twelve graduating seniors have been named Syracuse University Scholars, which is the highest undergraduate academic honor bestowed at the University. University Scholars represent the entire SU graduating class at the May 15 Commencement ceremony. On April 27, the scholars took part in a reception at the Chancellor’s Residence hosted by SU Chancellor and President Nancy Cantor, at which they received special medallions to be worn at Commencement. 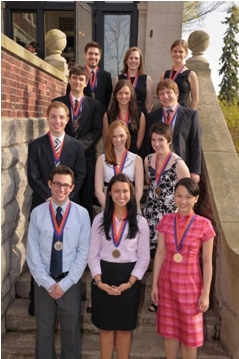 The SU Scholars Selection Committee, a University-wide faculty committee, selects the 2011 scholars using criteria including coursework and academic achievement, creative work, a personal statement and a faculty letter of recommendation. Kenneth Johnson, chair of the selection committee and assistant professor of communications and rhetorical studies in SU’s College of Visual and Performing Arts (VPA), notes that the committee evaluates how each scholar has engaged the world with his or her knowledge and experience. Additionally, nine seniors from the SUNY College of Environmental Science and Forestry (SUNY-ESF) have been named Departmental Scholars. Benjamin Forry, a mechanical engineering major in the L.C. Smith College of Engineering and Computer Science (LCS), has worked with the SU Industrial Assessment Center auditing for energy savings for clients. He also worked in the engineering department of the Oswego Nine Mile Point nuclear power plant and conducted solar cell research at NASA’s Glenn Research Center in Cleveland. Forry is an academic excellence workshop facilitator for engineering students on campus, helping them to strengthen their understanding of coursework. He also served as president of the Tau Beta Pi engineering honors society. After graduation, Forry plans to work with General Electric Aviation in the corporation’s Edison Engineering Development Program and will pursue a master’s degree. John Harland Giammatteo, a double major in anthropology and magazine journalism in The College of Arts and Sciences and S.I. Newhouse School of Public Communications, respectively, is a Remembrance Scholar and will serve as a college marshal for Commencement. A Coronat Scholar at SU, he conducted research with refugee populations in South and Southeast Asia and has written for Forced Migration Review, a magazine providing global forum on refugee issues. In his capstone project he studies how Burmese migrants adapt to life in Thailand. Giammatteo has written for a number of campus publications and newspapers, and served as an associate producer for a local public affairs radio show. After graduation, Giammatteo plans to continue graduate study in global migration at City University and South East Asian studies at the School of Oriental and African Studies. Kevin Michael Hirst, a double major in television-radio-film and marketing management in the Newhouse School and Whitman School of Management, also carries a minor in theater in the College of Visual and Performing Arts. A four-year member of the First Year Players student theater group, Hirst was also an executive news producer at CitrusTV, served as senior vice president of the Delta Sigma Pi business fraternity and was involved in Newhouse and Whitman ambassador programs and the Pulse Performing Arts student advisory board. OrangeSeeds, University 100 and orientation leadership roles round out his community service at SU. Hirst’s triple interests in marketing, television and theater fueled four internships and five professional jobs, ranging from Wegmans Food Markets to the Tony Awards to the Vancouver 2010 Winter Olympics. Also a Remembrance Scholar, Hirst will serve as a college marshal for Commencement and is designated a Scholarship in Action Scholar. Following graduation, Hirst plans to work on the upcoming Tony Awards, then move to broadcast work in New York City at the SpotCo entertainment advertising agency. Gabriel Thomas Jewell-Vitale is a fifth-year architecture student in the School of Architecture whose photography work from his semester in New York City appeared in the Architecture League of New York’s exhibition “The City We Imagined/The City We Made: New New York 2001-2010,” which analyzed the changing built environment of the city during the Bloomberg administration. Jewell-Vitale also spent two semesters abroad. While in Florence, he was nominated for the Coluccio Salutati Award, which rewards high integration into Italian culture. As recipient of a Ralph T. Walker travel grant, Jewell-Vitale traveled to the city of Ceuta, Spain, across the Strait of Gibraltar from the Spanish mainland to conduct thesis research on the European Union border wall between Spain and Morocco in North Africa. During his visit, he was interviewed and published in the Ceutan paper about his work on the present cultural and geopolitical situation. Jewell-Vitale’s thesis proposes a hybrid territory along the Spanish-Moroccan border. Qi Wen Li, a biochemistry major in The College of Arts and Sciences and a Remembrance Scholar, discovered her passion for scientific research while working in the laboratory group led by Robert Doyle, associate professor of chemistry, with whom she is now a published researcher. A McNair, Ornstein and Crown Scholar, Li’s research has been supported by the iLEARN program at SU. She undertook summer research at Yale University through a Mark and Pearle Clements Internship Award and pursued research abroad at the Graz University of Technology in Austria as part of the National Science Foundation’s International Research Experience for Undergraduates (iREU) program. Li plans to continue her studies in a doctoral program in biochemistry and molecular biophysics at the California Institute of Technology. Carolyn Cole McChesney came to SU to study communications at the Newhouse School, but a freshman geography course introduced her to her true passion, along with themes of sustainability; immigration and migration; ethnicity and race; and social and environmental justice. Majoring in geography and television-radio-film in The College of Arts and Sciences and Newhouse School, respectively, the Remembrance Scholar recently completed an honors capstone project titled “An Ethnography of Polish Immigrant Women Residing in the Suburbs of Chicago, Illinois.” McChesney is also a Phi Beta Kappa member, a sister of Gamma Phi Beta and has contributed to several service organizations on campus. Following graduation, McChesney’s plans will take her to Atlanta as a Teach For America corps member, where she will teach middle- or high-school English for two years. William Joseph “Joe” Ralbovsky, a policy studies major in The College of Arts and Sciences, has a focus on energy policy, air pollution and biotechnology and carries minors in both environment and society and geography. While at SU, Ralbovsky has worked with SU Project Advance and with development of the Connective Corridor in the city. He studied international policy abroad at Strasbourg, France, and has interned with the U.S. Environmental Protection Agency, where he served as a communication program assistant in the Clean Air Market Division. Ralbovsky is a member of the Renée Crown University Honors Program and of Phi Beta Kappa and plans to pursue graduate degrees in international relations and public administration through SU’s Maxwell School of Citizenship and Public Affairs. Teresa Soldner, a triple major in chemistry, Middle Eastern studies and international relations in The College of Arts and Sciences, came to SU as a Coronat Scholar and will serve as a college marshal for Commencement. Also a Remembrance Scholar and a member of Phi Beta Kappa, Soldner participated in the Renée Crown University Honors Program, was an active member of Kappa Kappa Psi and the SU marching and concert bands and sang a cappella with the Mandarins. She worked with the laboratory group led by chemistry associate professor Doyle, studying novel vaccines and vitamin carriers. Soldner studied abroad in England, Spain and Turkey; attended the American University in Beirut for advanced Arabic language study; and served as a member of a rural health expedition in the Indian Himalayas. After graduation, Soldner will continue study toward a medical career, through Michigan State University College of Human Medicine. Kristin Anne Waller, an environmental engineering major in LCS, has served as the vice president of the Tau Beta Pi engineering honors society and is a member of the Phi Kappa Phi and Chi Epsilon civil engineering honors fraternities. She has also served as an officer in the SU chapters of Engineers Without Borders and American Water Works Association. Other groups in which Waller holds membership include the Society of Women Engineers, Society of Environmental Engineers, Golden Key International Honour Society and the National Society of Collegiate Scholars. As a rising junior, Waller won a two-year undergraduate research fellowship from the U.S. Environmental Protection Agency, which offered her the opportunity to complete an independent research project in tandem with a 12-week summer internship within the agency. Her research evaluated changes in Adirondack surface waters in response to the 1990 Clean Air Act Amendments relative to the regulation of sulfur dioxide emissions from power plants. She presented her research at the fall 2010 technical meeting of the National Atmospheric Deposition Program. Waller is currently interning for the consulting engineering firm of O’Brien and Gere and will continue in the firm’s employment after graduation, working on water and wastewater treatment design. Sarah Katherine Jane Wendel, a biology major carrying a Chinese studies minor in The College of Arts and Sciences, is a Remembrance Scholar and participates in the Renée Crown University Honors Program at SU. Also, she is active as a science tutor for undergraduates. Wendel’s three study abroad experiences include English language mentoring in Hong Kong and hospital and clinic internships in Cusco, Peru, and Tanzania, Africa. Her work in Peru was supported by a Mark and Pearle Clements Internship Award. Locally, Wendel currently serves as an emergency room observer at Upstate University Hospital, shadowing an attending physician in pediatrics. Wendel also volunteered at Crouse Hospital previously. She serves on the executive board of Habitat for Humanity’s SU chapter and advises students traveling to Hong Kong about aspects of life abroad. Bridgette K. Werner, a Latino-Latin American Studies and photography major in The College of Arts and Sciences and Newhouse School, lived in Bolivia for 11 months before beginning her studies at SU. She has visited the country twice since. In Bolivia, Werner served as a tutor in an after-school program for low-income children, where she played a part in restructuring the program. Werner’s capstone project looks—through a photographic lens—at the formation of family at Stansberry Children’s Home in Santa Cruz. The final product is a book of photography and writing. Werner has also researched and written about the role of the Catholic Church in El Salvador during the 1980s, relative to human rights and the theology of liberation; and at Bolivian miners’ unions and related resistance or repression under 20th-century dictatorships. Werner, who is fluent in Spanish, hopes to live and work abroad again. She plans to pursue graduate education in international development or international relations, with a regional focus on Latin America. Melanie A. Zilora, a double major in economics and policy studies with a mathematics minor in The College of Arts and Sciences, is also a Coronat Scholar. As an undergraduate, she has been an active member of the Syracuse University Debate Society and the Student Standards Committee. Zilora studied abroad in London the fall of her junior year. An Upstate New York native, Zilora currently works as a research assistant for a Rochester-based think tank and at SU’s own Center for Policy Research. After graduation, she plans to pursue doctoral studies in public policy and economics at Carnegie Mellon University. Benjamin Nelson, Department of Sustainable Construction Management and Engineering. SUNY-ESF department honors will be bestowed upon students in each of the college’s discipline areas during convocation exercises on Saturday, May 14. SUNY-ESF President Cornelius B. Murphy Jr. will present medallions to the Departmental Scholars.